Gatton, a rural town between Ipswich and Toowoomba, is 80 km west of central Brisbane. It is the main town in the agriculturally diverse Lockyer Valley, which is situated on a stream system that enters the Brisbane River near Lowood. The Lockyer Creek was identified by Major Edmund Lockyer in 1825, and settlers entered the valley in 1841, mainly by taking up pastoral runs. Within ten years a rudimentary hotel was established on the creek at a place called Gatton. The origin of the name is obscure: Gatton Park, Surrey and Gattonside, in the former Scottish county of Roxburgshire, have been suggested. The township was proclaimed and surveyed in 1859, and town allotments were sold in 1860. In 1866 the railway line from Ipswich reached Gatton. Its arrival coincided with closer-settlement immigrant farmers entering the Lockyer Valley, including many Irish and German settlers. A Catholic school was opened in Gatton in 1868, alongside the usual civic facilities of a post office, police station, court house, and hotels. A government primary school opened in 1876. Local government, the Tarampa divisional board, was established in 1879, extending to Laidley and Lowood. 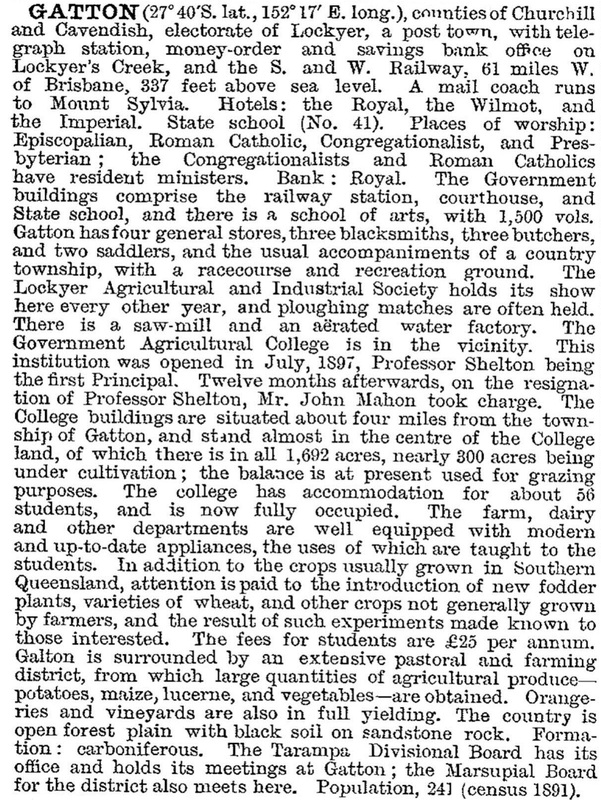 Gatton and Laidley co-hosted the Lockyer Agricultural and Industrial Society's annual shows (1891-1922), which fostered the diverse agricultural industry emerging in the Lockyer. The town was the site of infamous unsolved murders when Michael, Ellen and Norah Murphy were returning home from a cancelled dance outside Gatton on Boxing Day in 1898 when they were forced off the road and brutally murdered just outside the town. The two sisters were raped before being beaten to death, and Michael was shot and bludgeoned to death. The case made national and international headlines. Gatton was spared the scourge of prickly pear (the infestation was west, near Helidon), and during drought times there were small irrigation works. The prospect of extensive irrigation came with reticulated electricity in the 1930s for pumping underground water for spray irrigation. Fires were a continuing menace: one took out the dairy factory, but later ones missed the high school (opened 1917) and the hospital. Not so lucky were the school of arts in 1931 and the shire hall in 1941. The shire offices, long without a permanent home, moved to a new building in 1959. A memorial to the Boer War, in Crescent Street, and a 'Weeping Mother' World War I memorial, in Hickey Street, are listed on the Queensland heritage register. During the postwar years Gatton's population more than doubled, reaching 5000 in 1991. The decline in dairying was offset by expanding horticulture and market gardens, as land for these industries in Brisbane was lost to housing. Vegetables were grown for fresh food and for preserving. The shire's population also nearly doubled, an indication that the town has not acted as a population 'sponge' on its hinterland. Consequently the town's retail and civic facilities have a substantial non-town client base. Gatton has a comprehensive shopping area (including Gatton Plaza, opened in 1980), golf, bowling, swimming and horse racing venues, a showground, a hospital, a Catholic primary school (1917), Lutheran (1982) and State primary schools, a State high school (1961), numerous churches, a heritage museum and a civic centre. Additions were made to Gatton Plaza and the central shopping strip in 2004. The showground includes an indoor sports centre, and basketball and tennis courts. The agricultural college, a campus of The University of Queensland, is east of the town, and includes veterinary teaching and research facilities. On 10 January 2011 the Lockyer Creek flooded low-lying houses in the town. Residents were evacuated to the Gatton shire hall, joining those from Grantham and Helidon where upstream floods were even more destructive. Some residents were air lifted from roof tops. After 15 years of trials, researchers at The University of Queensland in Gatton began cultivating the first commercial crops of the red bayberry outside of Asia in 2014 on their test sites. Construction began in 2013 on a new aquatic centre in Gatton to feature a 10-lane Olympic-sized swimming pool, a learn-to-swim pool, a clubhouse with kiosk and interior refurbishments to the sports centre.